Google's OnHub devices would like to change the way you look at and interact with routers. They are designed to be simple to use, attractive, and intelligent. That's nice, since most routers are fairly complicated for the technically challenged and their blinking lights and protruding antennas make them look like tiny, ugly, Romulan mining vessels (most people would think of this as a negative, but I'm not so sure about the AP crowd). If you've been interested in trying out an OnHub router for a while, but have been waiting for the right deal to pop up, then now is your time to flash some plastic and buy one. 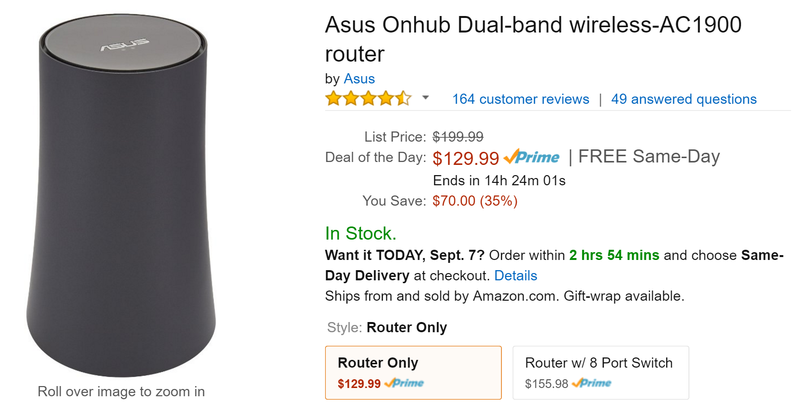 As part of their daily Gold Box promotion, Amazon has the Asus OnHub Wireless AC Router on sale today for just $130 – that's $70 off the MSRP, and $20 less than the last time we saw it go on sale. Not a bad deal, eh? If you want to pick one up then you'll need to act quick. The deal expires at the end of the day (or when Amazon runs out of inventory). There are no codes to fiddle with and the router ships free whether you are a Prime subscriber or not. Just follow the link if you are interested and you can buy for yourself. Happy interneting!